Most vipers are surface and tree snakes with a well-defined head that clearly seems larger than the body. In contrast, most cobras (elapids) have an inconspicuous head. The African Mole Vipers resemble elapid snakes in that the head is small and does not exceed the diameter of the body, which is 18 to 24 inches long. This clearly is an adaptation for moving about in underground tunnels where a big head might limit travel. Their trunk, which is a little heavier in the middle than at the ends, has become completely cylindrical. These shiny, black snakes have a very potent venom that destroys the nervous system of their prey, first paralyzing and then killing. The fangs are so long that they cannot be fully erected. Rather than opening the mouth to deliver a stabbing strike, the snake slips the lower jaw to one side, exposes a fang, and hooks the prey by a backward pull against the exposed fang. The viper can thus crawl up next to a mouse or lizard and “bite” it without “opening” the mouth. 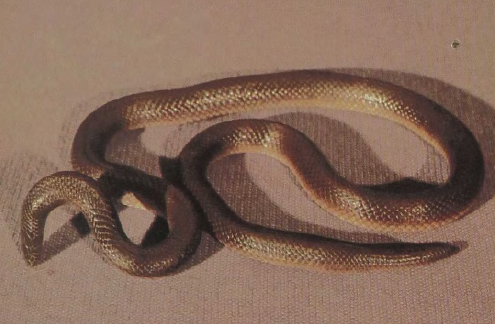 Many herpetologists have discovered, to their regret, that they cannot hold these snakes behind the head without being bitten.